Students at Grand Canyon University will benefit from tuition being frozen for the ninth straight year. As the cost of attending college continues to rise across the country, Grand Canyon University announced that it is freezing tuition on its west Phoenix campus for the ninth consecutive year. Tuition for the 2017-18 school year will remain at $16,500 for existing and incoming students, which has not changed since 2009. However, the vast majority — more than 90 percent — of GCU students also receive institutional scholarships that bring the average tuition cost to approximately $8,600, which is on par with public universities and well below other private schools. That total does not include federal aid, such as Pell Grants and subsidized student loans or external scholarships that lower students’ out-of-pocket expenses further. According to data released last week by the College Board, the average cost of in-state tuition and fees at four-year public universities across the country rose 2.6 percent to $9,650 in 2016-17, while the cost at four-year private institutions jumped 3.6 percent to $33,480. Housing costs at GCU also were frozen for next year although the average cost per student increased slightly after the university doubled the number of single-occupancy apartment-style rooms that its students desire. GCU’s average room and board cost of $7,153 remains well below the national averages for public four-year schools ($10,440) and private four-year universities ($11,890), according to the College Board. 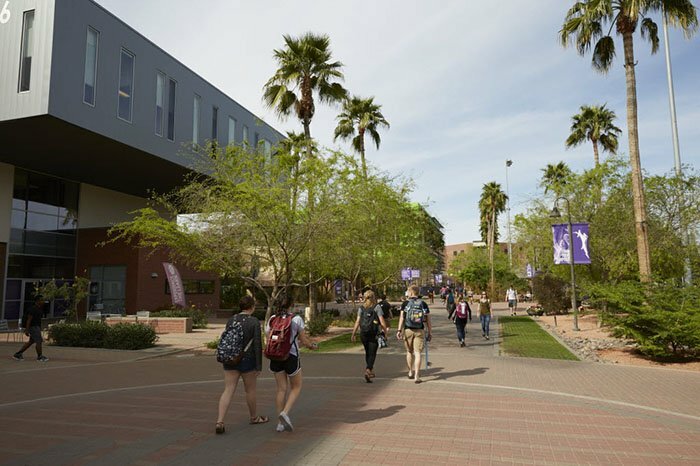 Since 2009, enrollment on GCU’s campus has grown from about 900 students to nearly 17,500 while the physical campus has tripled in size to 300 acres. The University has invested almost $1 billion in academic infrastructure that includes new degree programs throughout its nine colleges. GCU is putting the finishing touches on a 170,000-square-foot engineering building and also opened an 80,000-square-foot STEM building in 2015 as part of a larger initiative to meet the workforce demand for science, technology, engineering and math professionals in Arizona. In January, the university will complete a major renovation at 27th Avenue and Camelback Road, which houses the 152-room GCU Hotel, with a resort-like pool and the 200-seat Canyon 49 Grill restaurant, as well as a new office complex that will bring more than 2,000 university employees into the neighborhood each day. Earlier this year, GCU devised plans to launch new business enterprises that will afford recent graduates management opportunities while bolstering the economy in its west Phoenix neighborhood. Among the ventures is a coffeehouse called Grand Canyon Beverage Company, a merchandise apparel company called Canyon Promotions and a Canyon Exchange resale store. Revenue from the enterprises will help the University continue to hold the line on tuition and fund projects that will benefit current GCU students, Mueller said. Thank you for thinking about the students first! As a parent of a GCU student I am all smiles while reading this article! Thank you! !